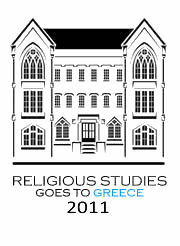 This site is devoted to the Department of Religious Studies‘ “REL Goes to Greece 2011” annual study abroad program–begun in 2008–which brings a small group of University of Alabama undergraduate students to Thessaloniki, Greece, for three weeks. Under “About” in the main menu click “The Trip” to learn more about what we do while in Greece. This site’s content (i.e., the posts created by all those participating in the May 2011 trip) focuses on the ways in which different versions of an idealized past are created and communicated by different contemporary social actors–in their narratives, behaviors, and institutions. Under “About” visit “The People” to learn more about who we are. Visit the pages grouped together in the main menu under “The Past Perfect” to learn more about the theoretical issues that this trip and this site help us to think through. And consider browsing through the categories we’ve used to organize the site–categories that place emphasis on the specific situations in which we, as visitors and observers, interact with this thing that we call the past. Of course you can also use the calendar, posted at the bottom of each page, to view the posts in their chronological order. Links to helpful secondary sites (such as Wikipedia or the web pages for the museums we visit) will appear throughout the site. The first posts on the site, created prior to our departure for Greece, all focus on how each of the contributors recall first becoming aware of a place in the world called Greece and its significance for us. The image used in the site’s main graphic depicts a Greek bust of a woman, dated to approximately 350 BCE. for creating the site (specifically, its always helpful web gurus, Amy Garner and John Hawkins).